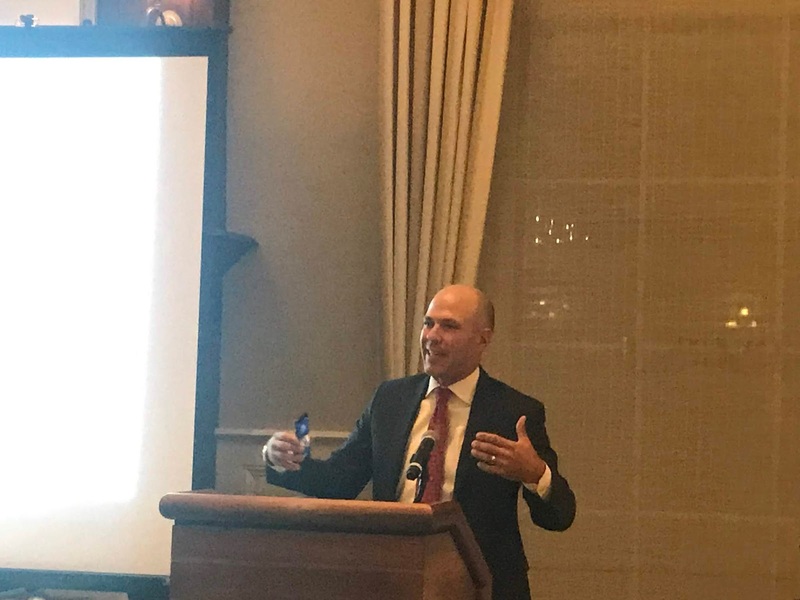 When you manage playing surfaces at a golf course, you attempt to manage for the masses, the average player which is the majority of players both male and female. We have Club Champions every year who rise to the top in their particular category who play of course better than the average. But for many clubs, there is a time and a place where players develop into outstanding golfers for the entire region that we encompass. A couple of years ago, Darren Stoffel won the District, Drew Pranger won the Metropolitan Amateur hosted at Glen Echo and Darren and Nathan Calcari won the 2 man at District. 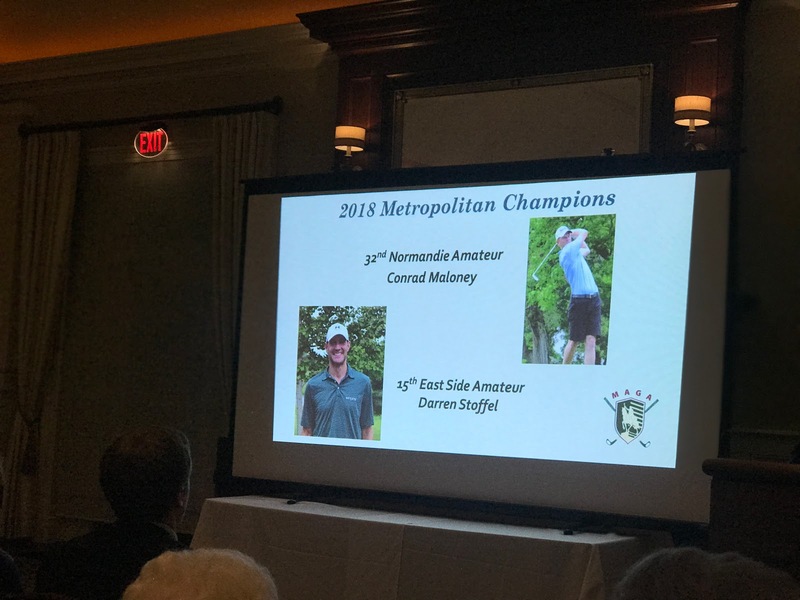 We have a number of players who have played well in local amateur events. 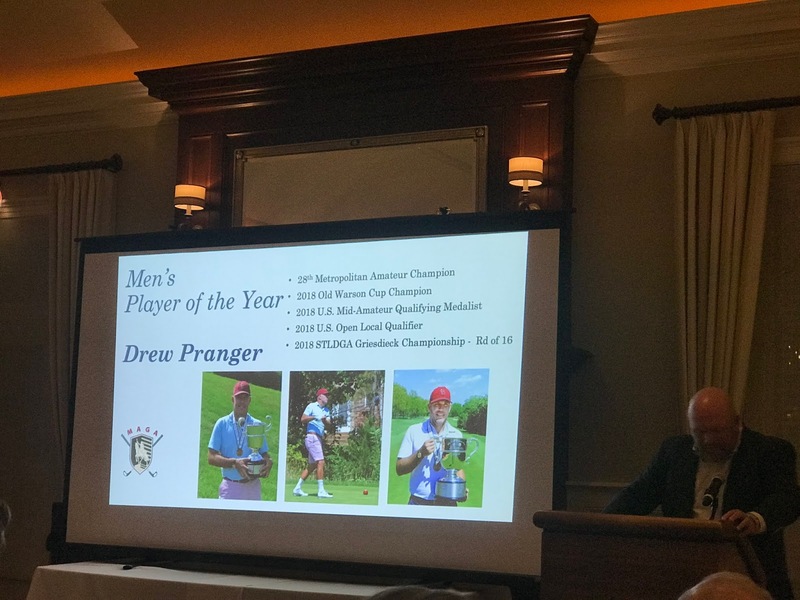 This season was an outstanding one for Drew Pranger. 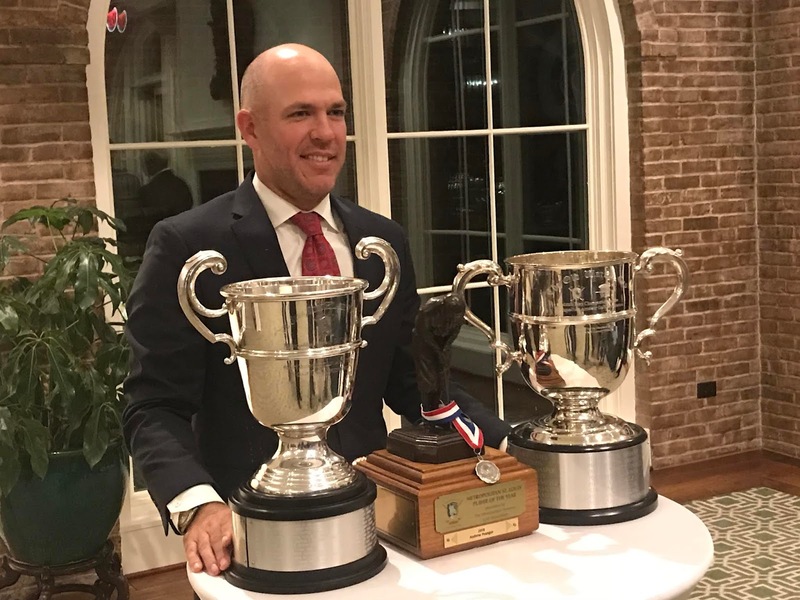 He won the Old Warson Cup in the spring, the Metropolitan Amateur in the summer, qualified for the US Mid-Amateur Championship and the Sectional of the US Open. 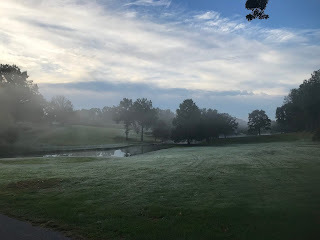 And by the way tied the course record at Glen Echo(Editors note actually tied in a year or more ago) at 63 and then beat it a few days later with a 62. (Editors note: Forgot he did the 62, and then 61) IN FUEGO!!!!!!!!!!! 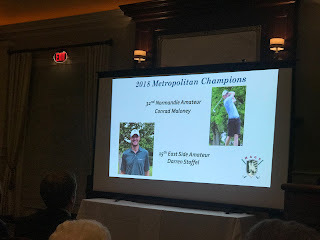 Before we get to Drew's award, we should recognize Darren Stoffel who won the East Side Amateur this past summer. 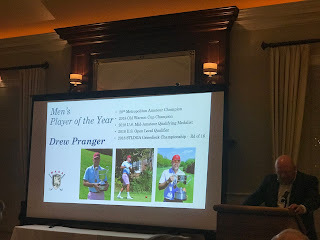 Last night, we had the pleasure of being at Old Warson CC to watch Drew receive his award. 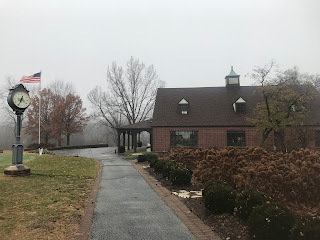 His family and Glen Echo friends were there as well. 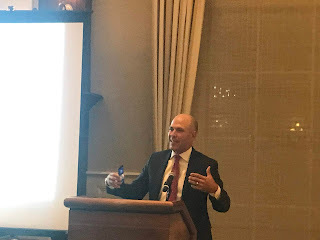 I took a short video of the ceremony and a few pics. We have a very competitive group of players right now who can beat the ball around a bit here at Glen Echo. It is fun to watch and I'm glad to be a part of it. I would be remiss if I did not post pics of Men's Senior Amateur Buddy Allen and Ladies Player of the Year Ellen Port. Had the pleasure of getting to know Ms. Ellen Port when I started at Sunset in 1990. What a great player she was becoming and has since. She is one of my favorites of all-time and our most decorated amateur golfer! Buddy Allen who had a great year. He's played a number of rounds at Glen Echo and can really strike his golf ball! Verti-Drain machine. 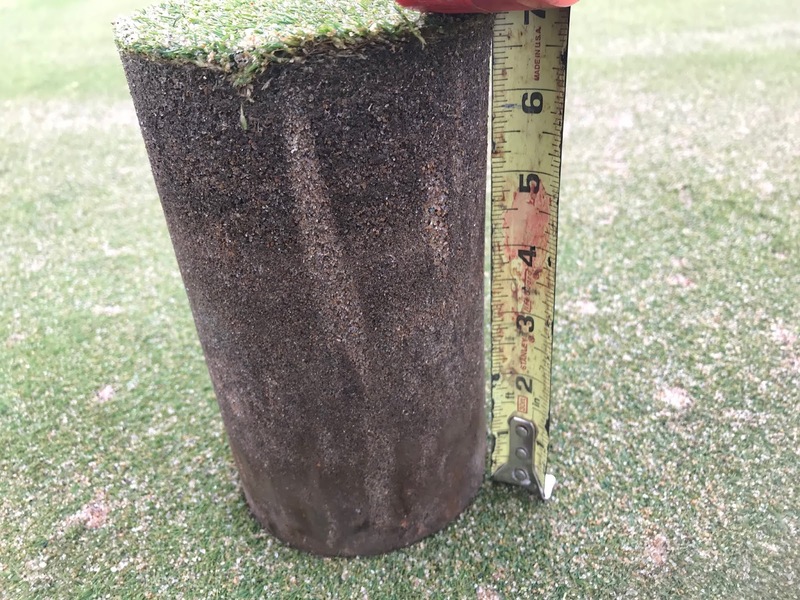 This process involved about 170 hours of labor, 42 tons of sand, 900 pounds of a soil amendment product, and approximately 1.6 million 1/2" solid tine holes put in our greens, collars and cool season approaches at an average depth of 7.5 to 8.0". 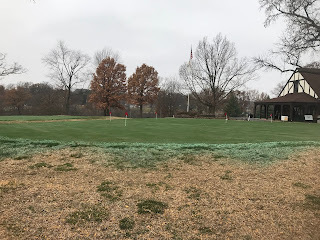 Applied a 50# bag of the soil amendment material to each green. Blew, brushed and pushed the sand into the holes and did a final smoothing of the sandy surface with a drag brush. 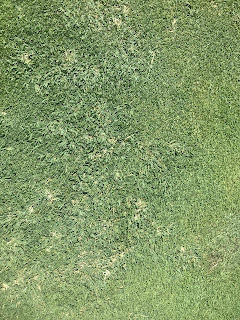 Mowed green surfaces with an old set of reels to cut off the tufts of bent grass or longer leaves of plants that were lifted up during the process. Improves drainage through our green profiles and assists in drying out wetter sections of greens. Exchanges good gas(oxygen) with an overabundance of bad gas(carbon dioxide). Improves drainage and oxygen which is great for developing new roots and improving existing root systems. Additional sand on the surfaces assists in smoothing the surface after the holes close back together and protects the crowns of the plant which is where roots and leaves start their lives. 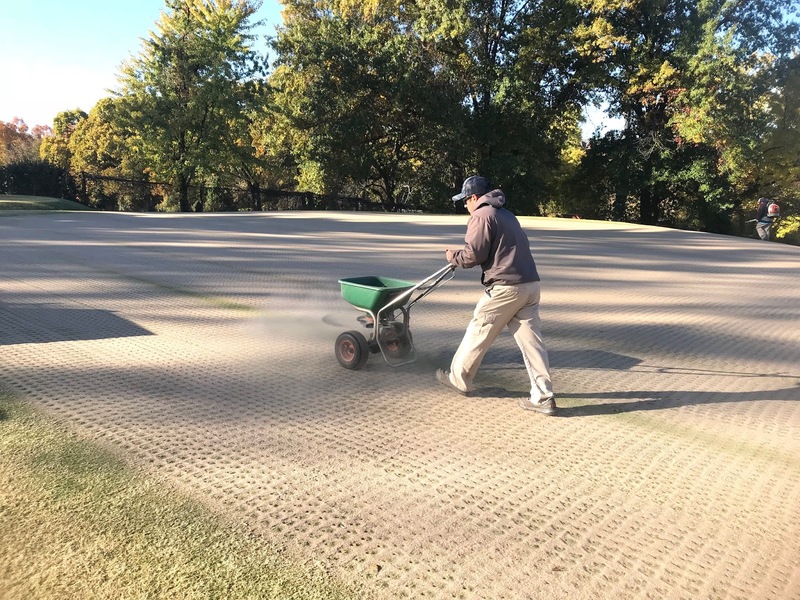 It also helps to dilute thatch or improve the mat layer which reduces the effects of ball marks and speeds up the process of healing as long as the mark is repaired by the golfer. Topdressing machine puts a layer of sand on the greens at about a depth of 1/4" more or less. This is the same machine that we place a very light topdressing layer on our greens during the season. 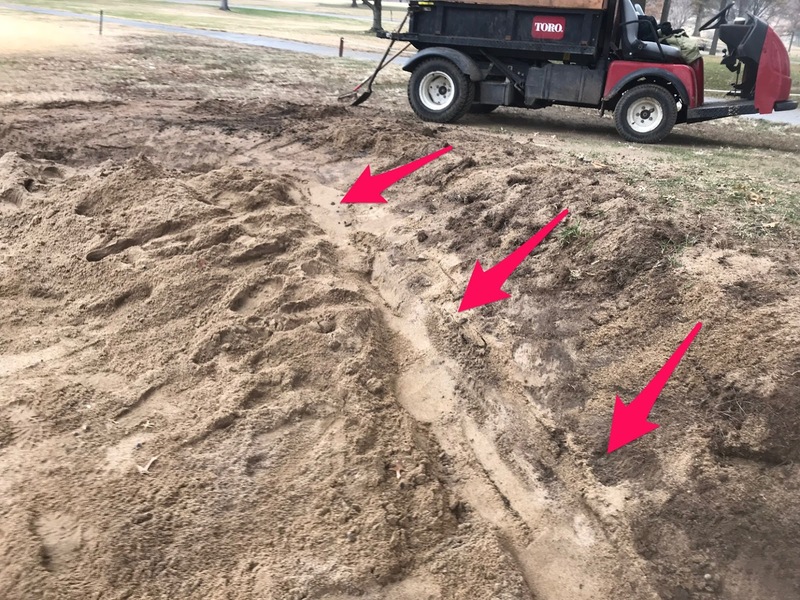 Approximately 3 hoppers of sand for the total golf course. It takes almost 2 loads of sand per the average sized green during aeration. A green such as 1 green we go across it 3 times for very light topdressing. 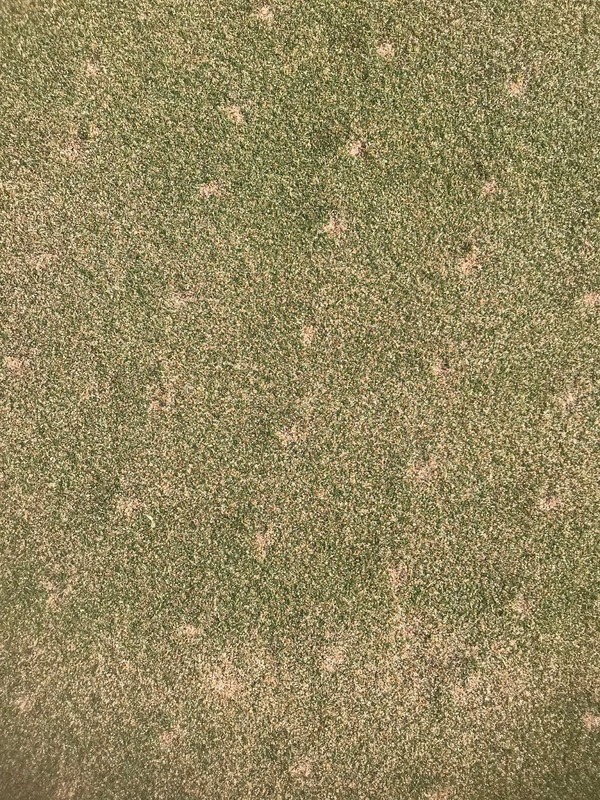 During aeration, its about 10 passes which could increase tire tracking on the greens which we attempt to prevent. The sand is kiln dried and reaches a temperature of well over 1000 degrees which dries it and kills the weeds and the bad actors in the sand. We brought our 45 tons of sand in on Thursday before the Monday activity so it would have a chance to begin to cool before placing it on the greens. 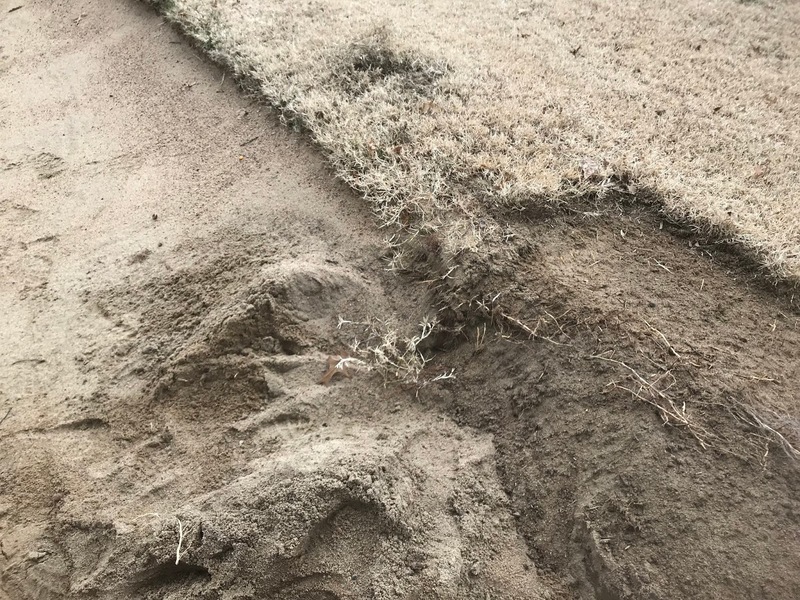 Sand too hot being put on at the heavier rate could literally cook the bent grass. We started the process before first light on Monday morning. 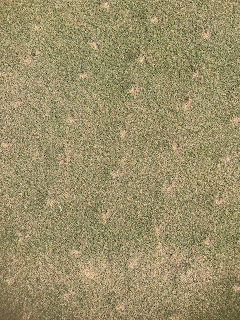 A daylight view of the aeration. 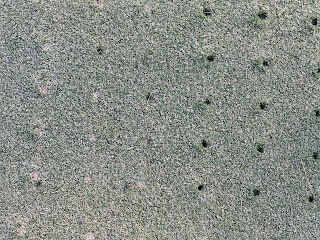 As you can see, 4 tines per holder with 6 arms placing 24 holes in our greens every 3" at a depth on average of nearly 8". Tom spreading soil amendment product which includes: Dry kelp meal, greensand, compost, rock phosphate, sulfate of potash magnesia, calcium carbonate, humic acid, zeolite, and compost. 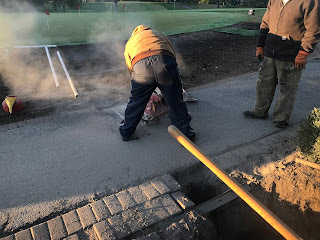 Pull behind blower and staff using back packs during sand into the hole. Dark thirty the 2nd day. Hole filled vs no fill. Completed, holes to the top!! 1. 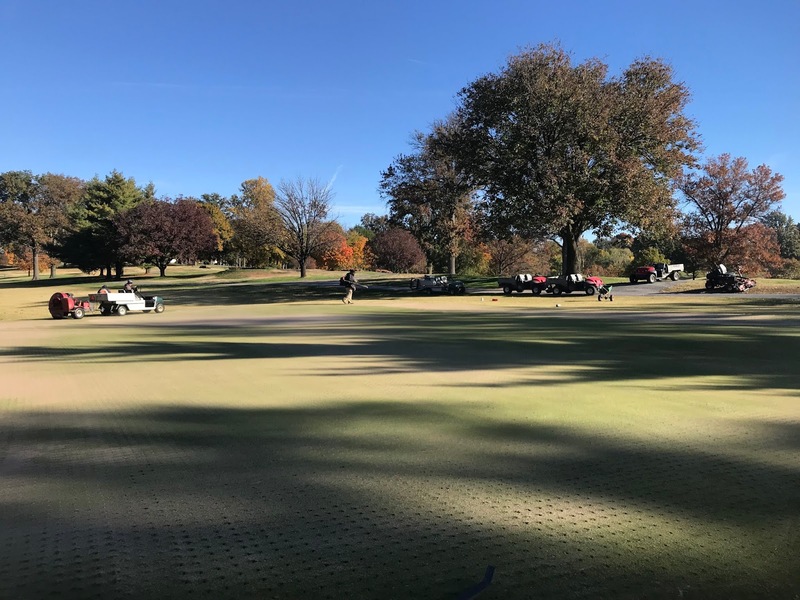 Below are pics of the end results.You can see the channels down into this 7" section of the practice green. The topdressing/sand layer has been applied to the greens for the last 30 to 40 years. At the last 2 inches is the soil layer which is being incorporated with aerating/topdressing sand over the years to allow moisture to drain out of the system. 2. Our overall roots grow in the top 3-4" of our profile but we have longer roots growing through aeration holes deeper in the profile up to 7" or more as you can see below. 3. 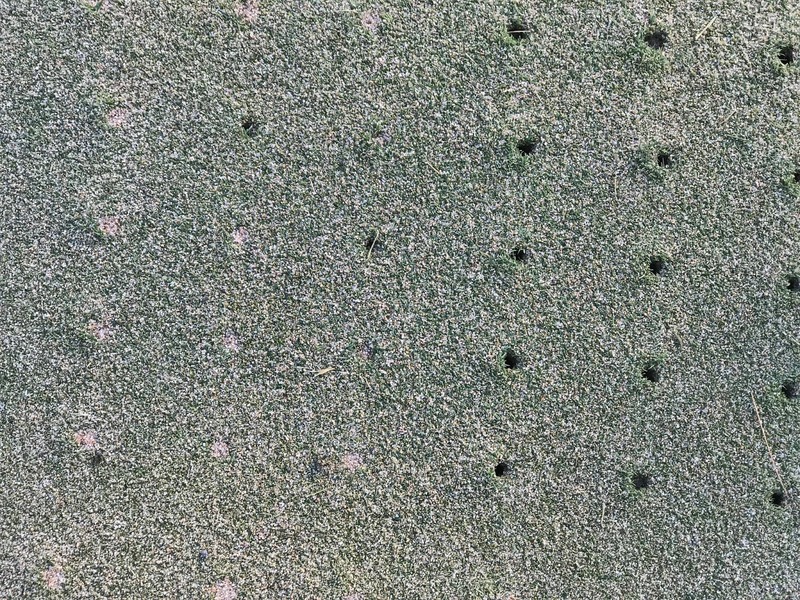 A large aeration hole from our Dry-Ject process that takes place each late winter/early spring up to 4" to 5" deep. 4. After the rains overnight and into this morning, water at the bottom of the 7" deep hole where I pulled a hole. 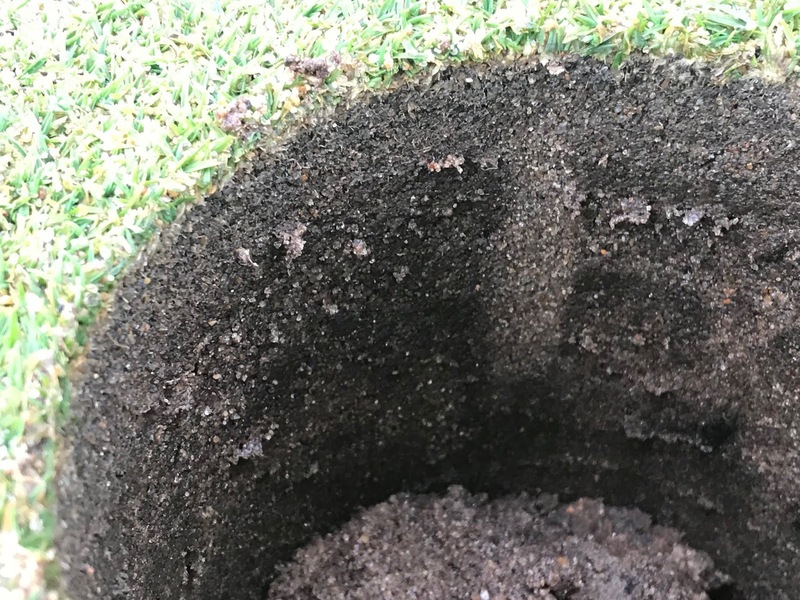 This moisture works through the 5-6" deep sand layer of the green and then enters through the 2" soil layer more quickly because of the deep-tine aeration holes. It will move directly through the soil and a much slower pace because of the tight soil particles. 5. 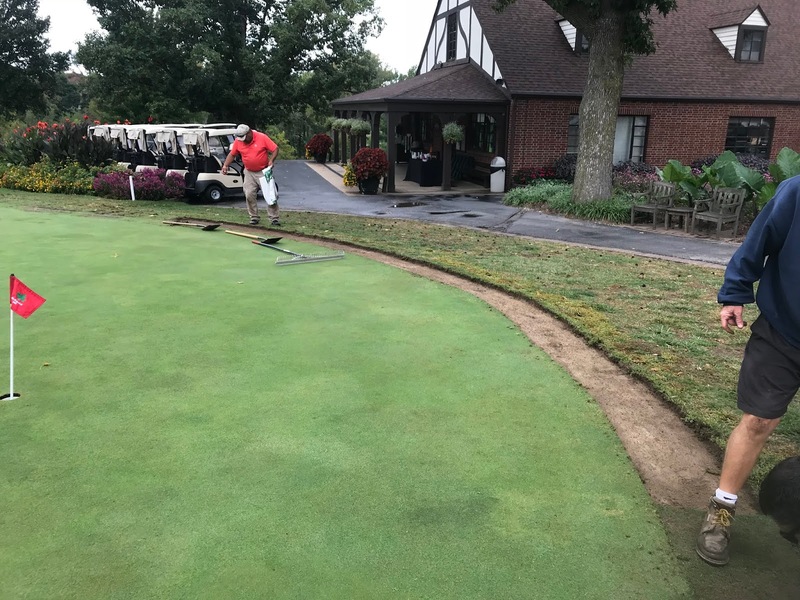 Below is a standard drainage system in most modern greens. We have one green that has drainage set up this way, green 9 renovated in the late 80's. 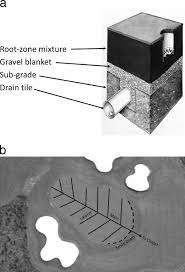 This system is designed so water will drain through the 12" sand layer represented by the dark section on top. The water will slowly build up in the bottom 3rd but will slow at the next layer which is gravel which creates a perched water table. The construction of this type of system in golf greens is to allow roots the opportunity to take up moisture into the bent grass plant as the water passes through the sand. Once the water pressure increases enough at the bottom of the interface between the sand layer and gravel, it then releases into the gravel layer. Too much moisture for too long of a period of time in the root zone will deprive the plant of oxygen which is needed for the plant to survive. 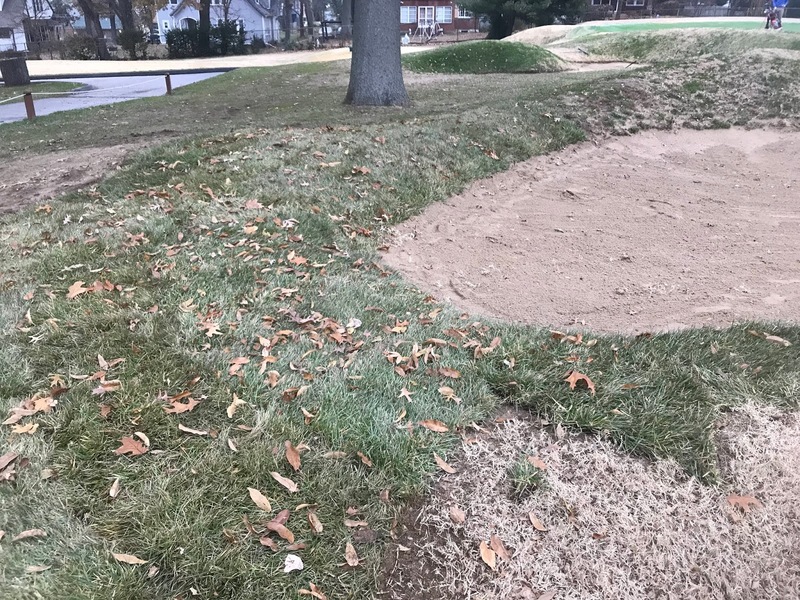 This is once of the issues we have with our greens at Glen Echo which do not have standard drainage systems. 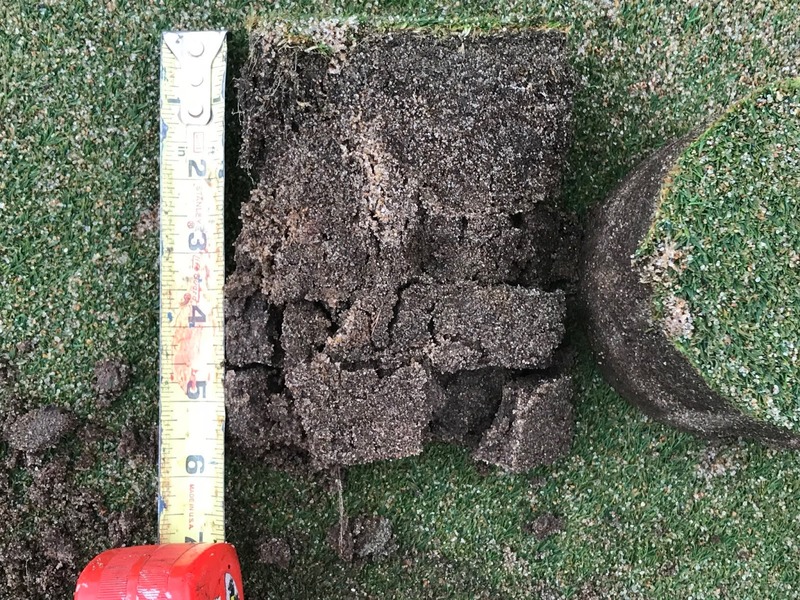 A higher than normal period of moisture can lead to negative results both on the putting surface and below surface in our root systems. 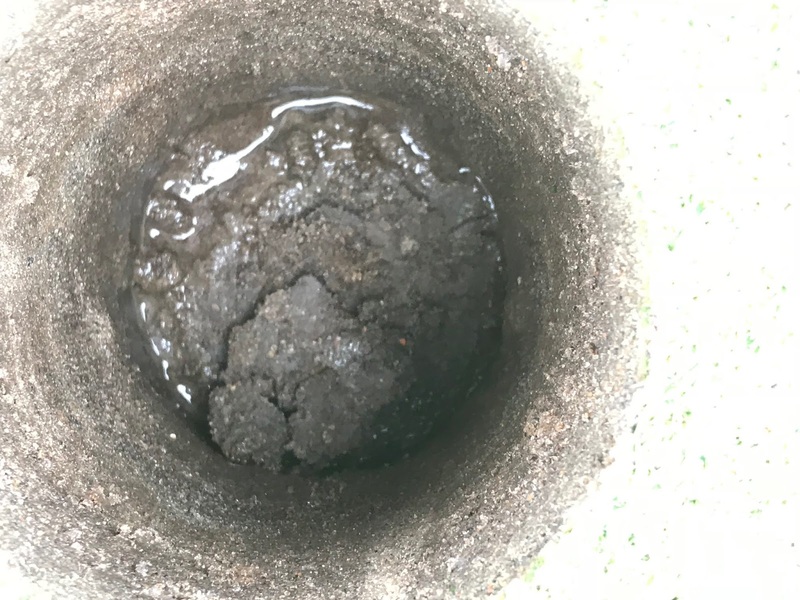 Once the water begins to drain through the gravel system it will then enter the small holes in the drain pipe and will exit from the green area. With our warm season turf heading further into dormancy, it is that time of year to give our driving range tees the rest they have deserved from a full season of divots and traffic from both equipment and our feet. 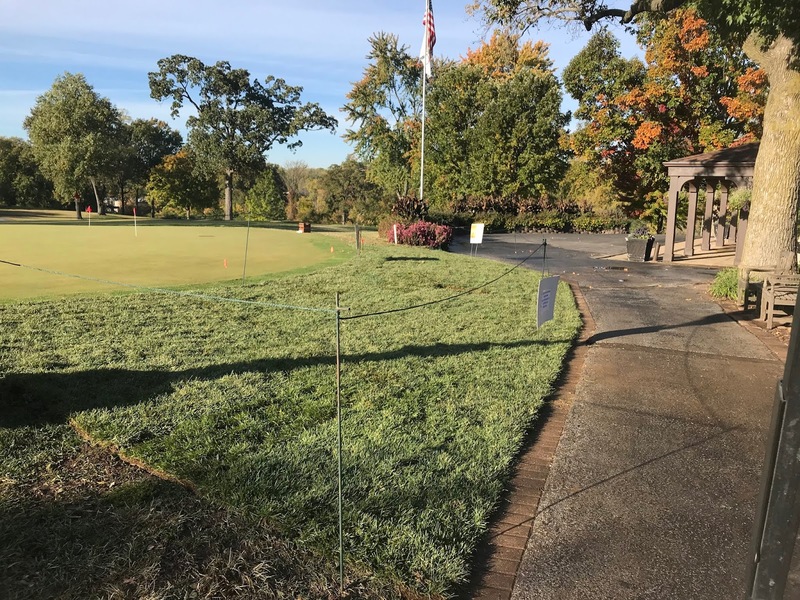 Dormancy does not allow the plants to recover and fill in for the next round of practice swings so we will be closing the grass tee surface after Sunday, October 28th until next spring when the turf is again actively growing. We understand your desire to hit off of the grass but for the health of the turf we must stay on the mats during turf dormancy.. We appreciate your cooperation in refraining from using the grass tees. Our staff finished the walk-off area to the practice green this morning during the frost delay. 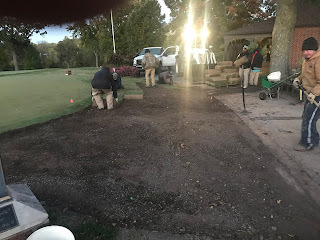 Irrigation was installed yesterday and it was sodded this morning. This area will be closed till next spring to foot traffic and equipment. Please do not cross the ropes. 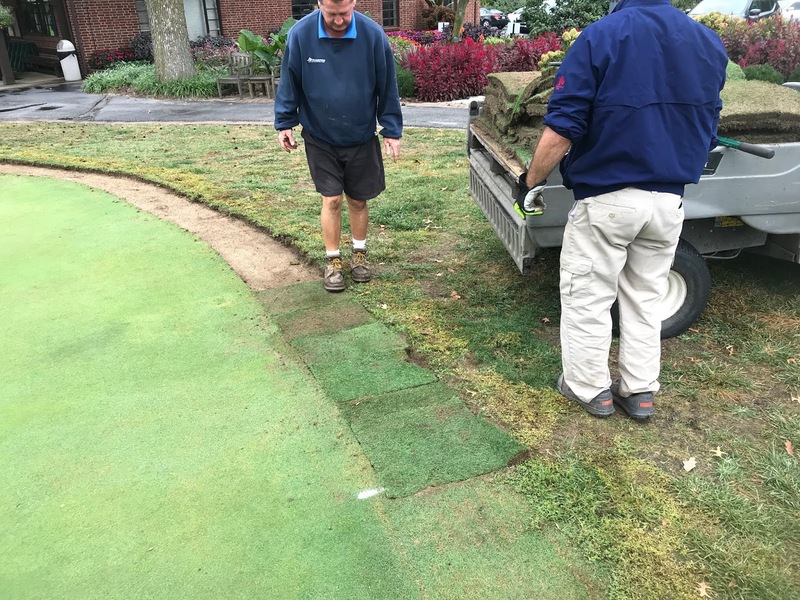 The area is totally saturated to allow the sod to heal in before winter. 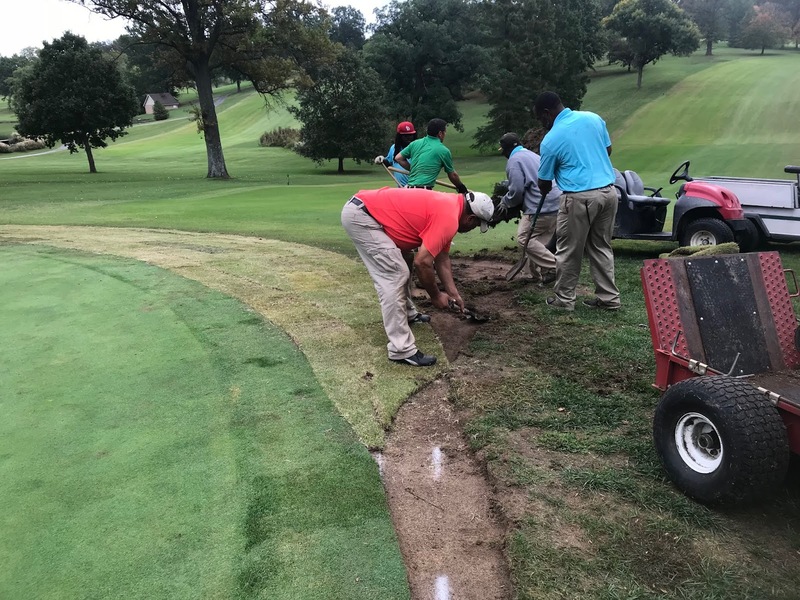 Cutting cart path to run irrigation across to the walk-off area. 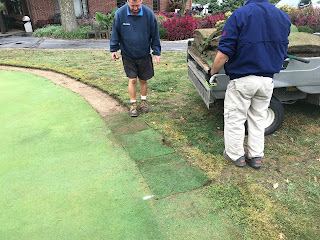 Laying sod along the path. Please don't walk on me. You could be up over your ankles in mud. Thanks! We experienced our first frost of the season today and it was heavy enough to create a slight delay. 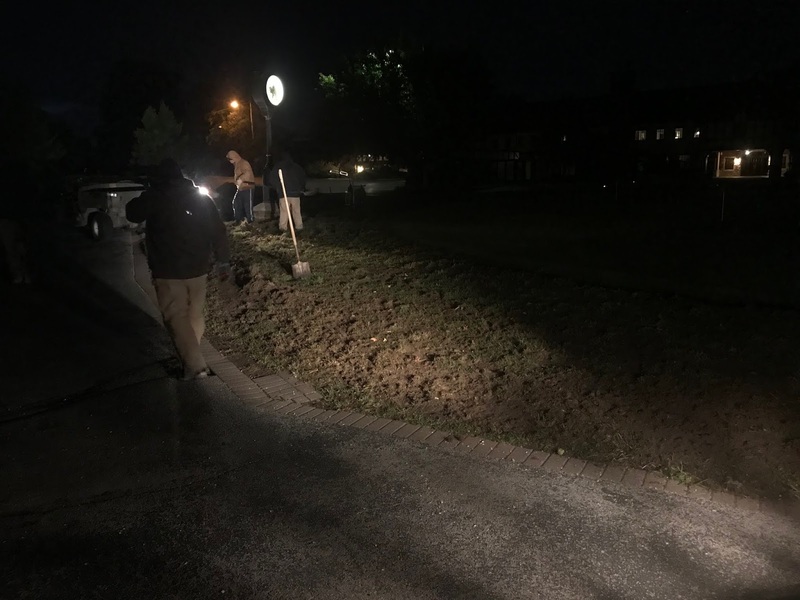 Be aware that this will occur more frequently as evening temperatures dip into the 30's and soil temperatures begin to cool. Excellent article on Frost Delays from the USGA and a video below. 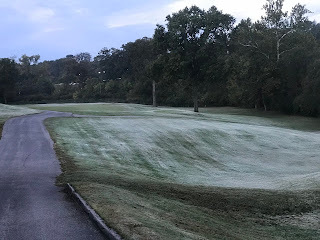 I'll give the Glen Echo Grounds Department's view on frost in the next week or two with another blog post. 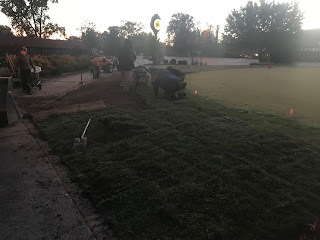 We have a number of turf renovations projects completed and taking place as I type these words. Over the years we have been replacing the false front approaches on the greens that are bent grass. We replaced #12 last week. It will sit dormant over the winter and will begin to grow in during spring. We intend to replace a number of other approaches next spring including 7, 10, 13 and 15. Guys finishing a corner of the intermediate near 12 green. Single lap collar on #12. 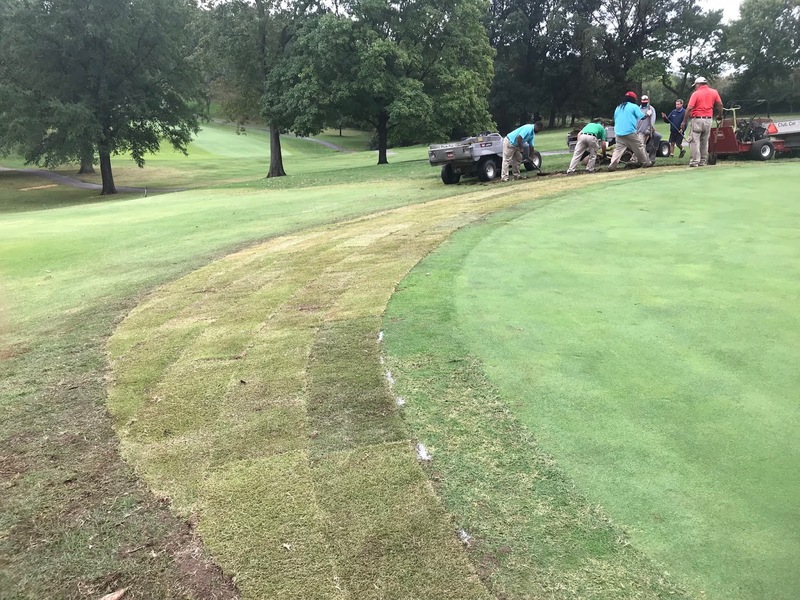 Saves club time in mowing, water since zoysia requires less water than bent grass and chemical applications. 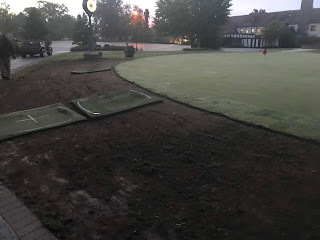 Replacement of collar on practice green walk on. As most of you have seen and can see from the pictures above, the practice green walk on area is not in great shape. We tore it out this morning and began the process of restoring this area. First thing we did was strip the existing sod to Doctor Ott's clock. Next we rented a large walk behind tiller and tilled the area as deep as it would go, 6-8 inches. Bought 2 yards of compost and tilled it in. Also added some bagged compost that we had stored. The next thing we will do over the next few days is to get some small irrigation heads installed that will only apply water to this area. We will install some human traffic control measures to spread the wear and tear. 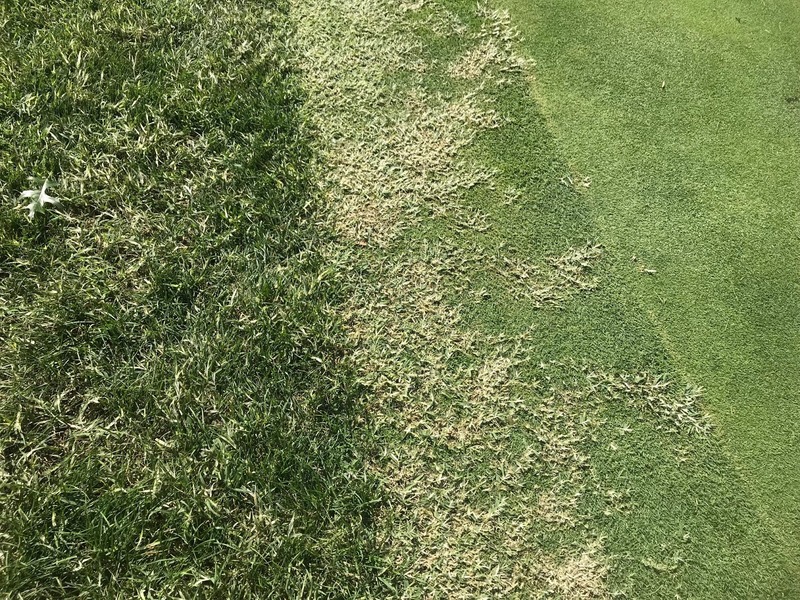 Provide proper cultural practices including multiple aeration over the season. 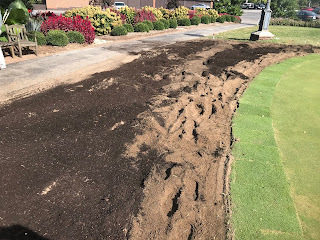 Fertilizer and chemical controls will also be need to improve the overall health of this area as well.Pictures and video discussion of the work we are doing at this site. Working in the darkness of morning. Frost on the turf so we had this work to do. 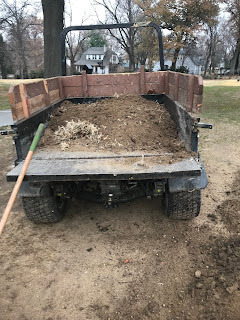 This is after sod was stripped. We do have mats for you to walk across the dirt area. After tilling below, the dirt is very soft and we don't want you tracking the dirt on your greens and into the pro shop. 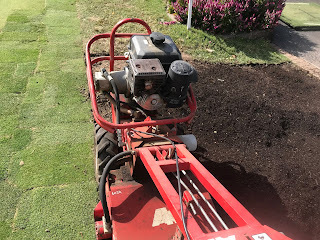 9 hp tiller I used to till up the pretty severely compacted soil and till in the compost. As you can see from the tracks, soft soil. I wanted to inform you of a couple of tree removals which will be occurring in the next few days. The green committee approved the removal of the red maple at the right front area of the 11th green. 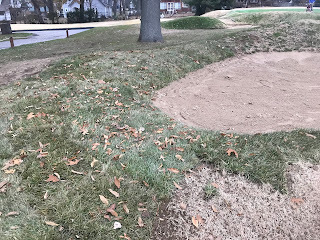 Also, the dual sassafras between #1 green and #2 tee has become severely compromised. We will be removing the left tree as well in the next few days. 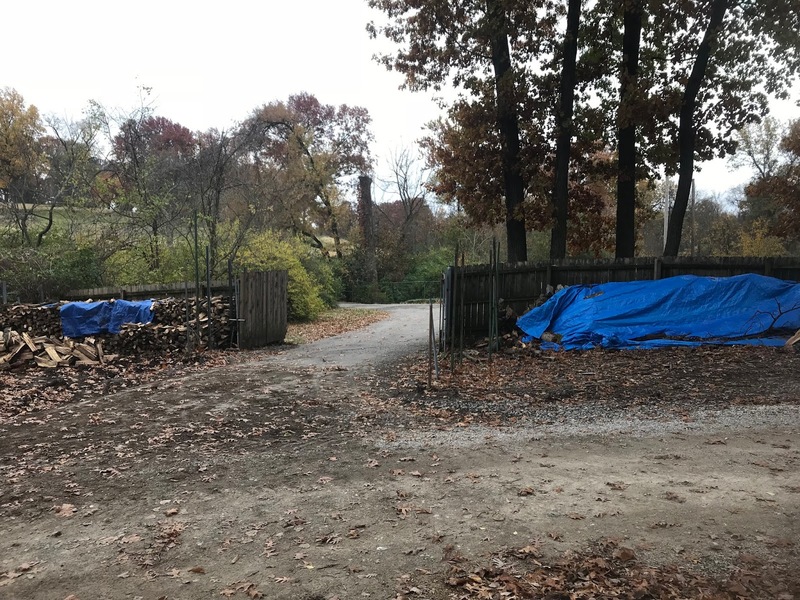 We were going to prune off the dead wood but after looking at the tree closely, there is not much to salvage and the safety of our staff is of utmost importance when we look at partial or full removals. There are a number of other tree removals that will be taking place over the next few months. There are some standing dead right now and others that are compromised and will need further evaluation. We intend to do this with the assistance of the green committee and an arborist to help us evaluate their health. 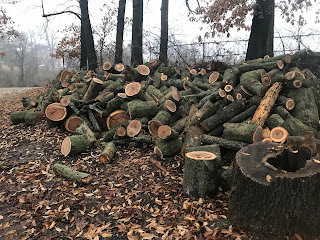 As an organization, we do not have the resources to plan a major tree removal program but we do have an aged group of Pin Oaks that are being compromised from a number of different things. 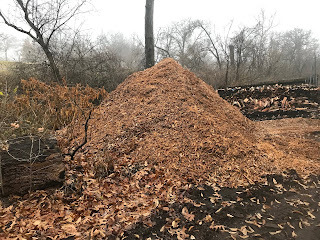 I've had discussions in the past with our arborist and I will invite him on site in the next couple of weeks to help us evaluate some potential remedies to slow this process down. 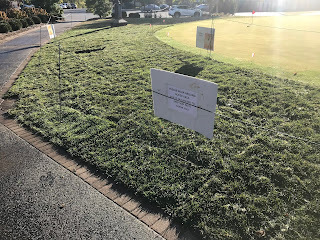 We also intend to move a tree from the nursery into the area on the left side of #1 where we have lost a couple of trees over the late summer. 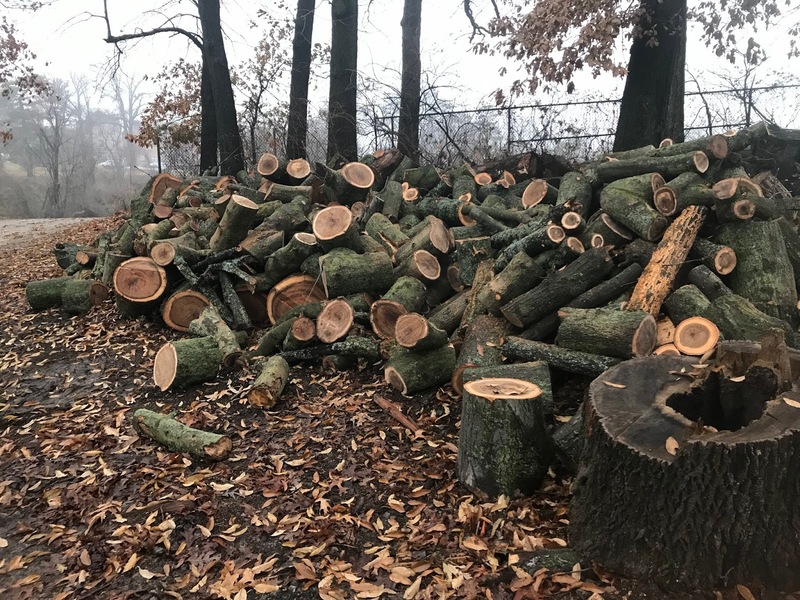 A good Tree Management Plan includes planning/paying for ongoing maintenance of the existing trees, removal of the dead/damaged/out of place trees, and preparing for replacement trees. Below is a link to an article which has some excellent information in it regarding a Tree Management Plan. 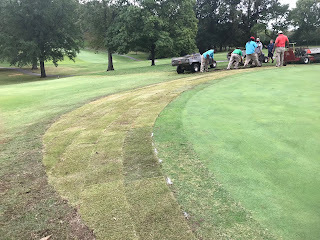 Over the last few weeks, the staff have been chemically treating our collars in an effort to weaken the bermuda grass that has invaded them. 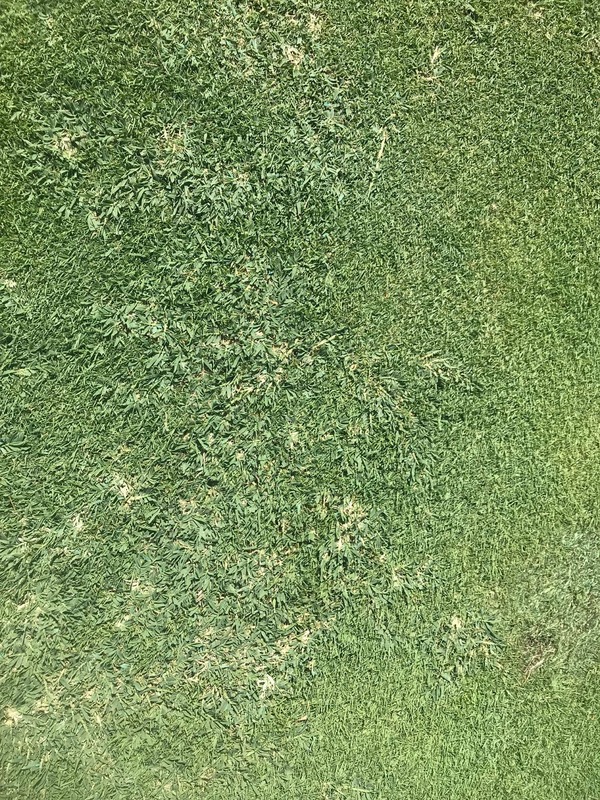 We've made 2 applications of a product called Pylex which is safe to use on collar height bermuda. 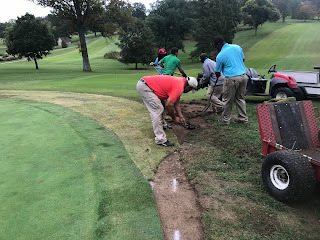 Today, the guys are renovating the collars and planting some bent grass seed around each collar. 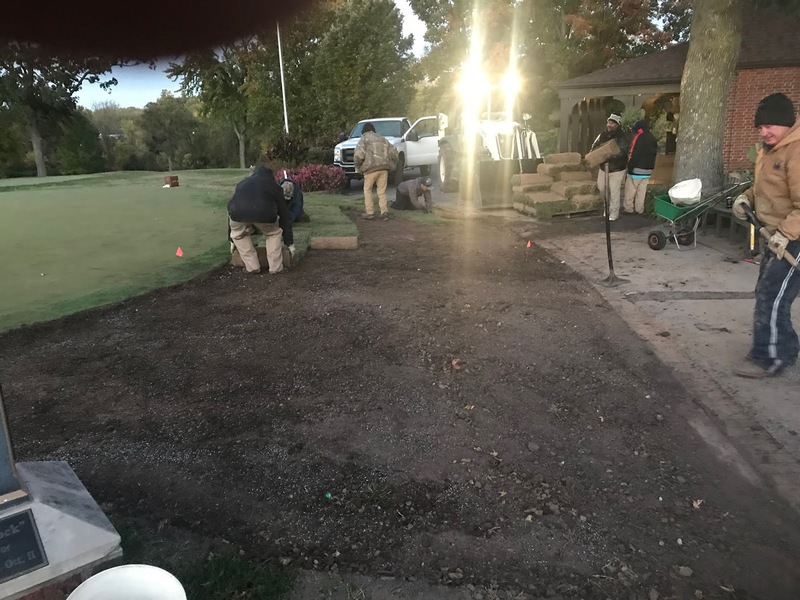 The overall process will not be completed until next spring. 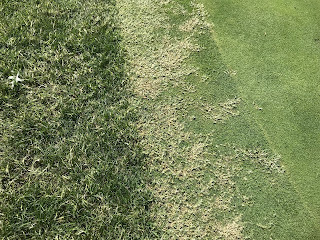 It will take the bent grass plants time to mature and spread. We wll have to also continue our bermuda grass sprays next spring and will have to work our way off the greens to reduce the amount of competition that enters the collars in the future. Used our Toro Walk behind aerator to place small and shallow holes one pass around each collar. 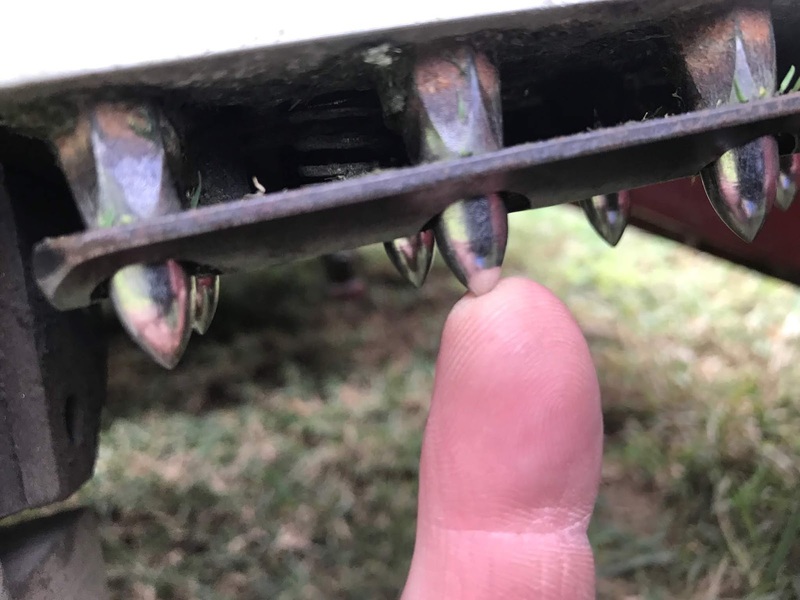 10 small tines per holder. We are using 3 sets on our machine which is about the width of the collar. As you can see, my pinkie still dwarfs the tine. 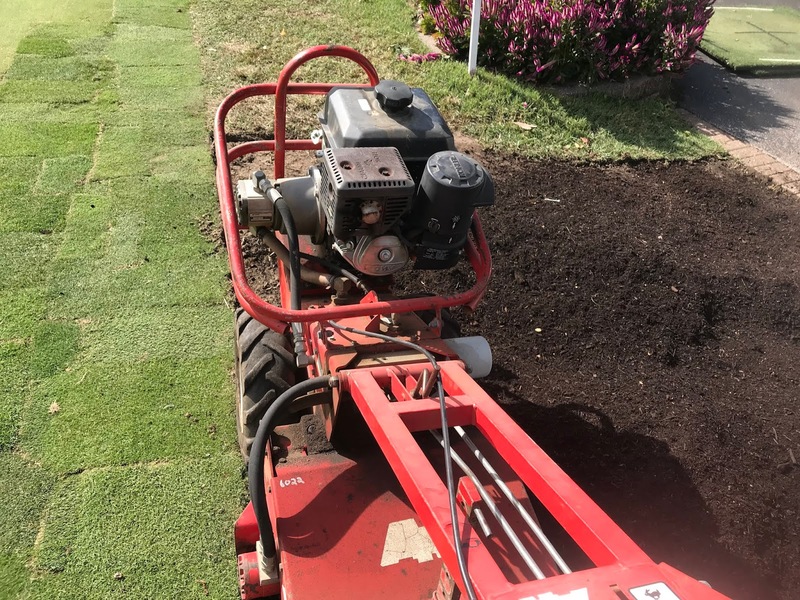 The tine goes into the surface no more than about 1/2" which provides enough room for the seed to drop in and be protected from a mower and adverse weather conditions such as high temperature. The remaining process will be illustrated in a couple videos below. 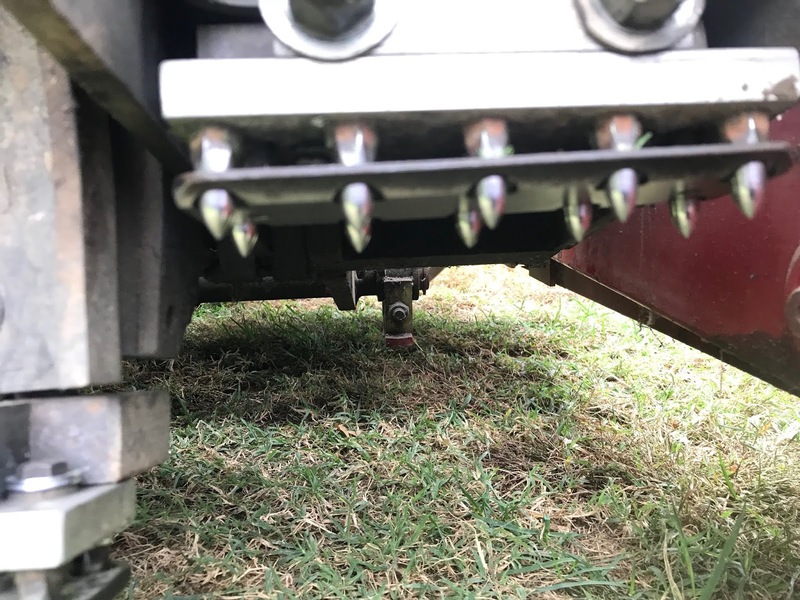 We then use our walk behind slit seeder to slice some lines into the collar creating a slight channel for the plants to germinate and mature. We then take a drop spreader with some sand and bent grass seed and drop it onto the collar surface. This is to insure we get seeds into the open spaces and the job saver tine holes. 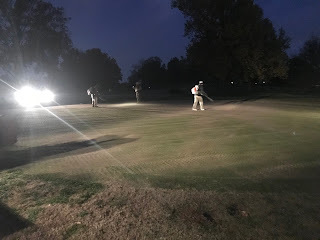 The collars are then hand brushed with a stiff broom and they are mowed without baskets to insure the bent grass remains on the green or collar edge.